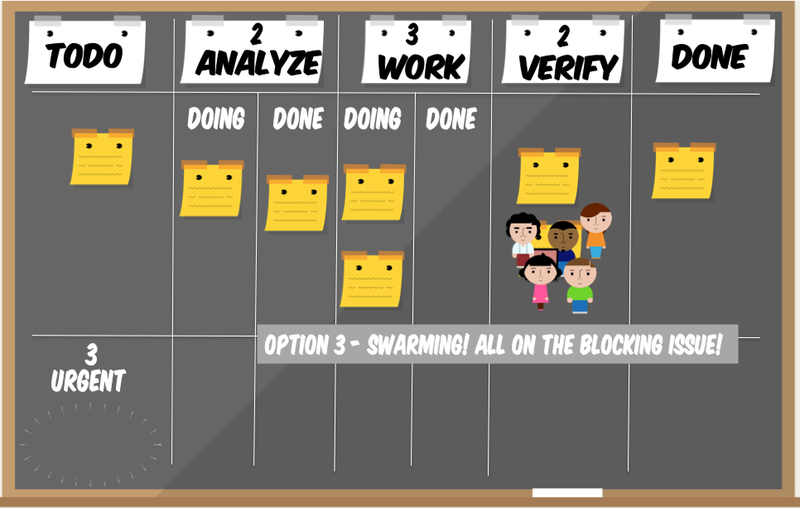 Given that you have a feature tracking through your Kanban board, the dev marks it done, it's pulled into QA, and the dev pulls in new work. Now what? You can't move it back into the dev stream as it's full. You can't move it forward into Deployment as it's not working properly. 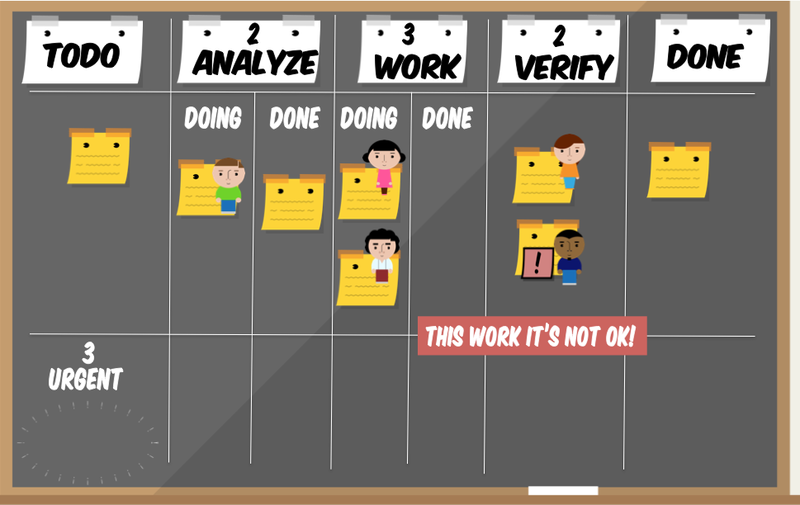 Since one of Kanban rules is to make policies explicit you should define what exactly "QA" stage in your process means and what kind of activities it covers. One of common approaches is that such stage covers both testing and fixing bugs, which means that it is perfectly normal to work on the code, namely fix bugs, when a feature is in QA stage. Of course you can choose an isolated approach as well, where unless feature is fully tested and decision is made whether it is good or not nothing in code changes. Note however that such approach basically hampers the flow as you create formal, and possibly multiple, hand-offs during testing/bug fixing stage. Thus, my first advice would be to treat your QA stage as the one covering both testing and bug fixing which basically renders the problem of moving index cards anywhere irrelevant. Additionally, since basically you should first deal with the features which are closer to completion a team member should first deal with any bugs they do have in features being tested and only then move to new features. Note: that I don't necessarily consider that a feature, which we found bug in, should automatically be blocked. If this is rather common situation I wouldn't do that. If you overuse blockers they don't have that much of value anymore. Besides, the question is: do you really need to treat it as emergency and swarm over a feature when just a couple of bugs are fund there? You may think of moving cards back but personally I don't recommend it. It just adds a lot of hassle. You can have policies that you can violate limits in such situation (as Siddhi suggests) but still I'd say the chaos it introduces isn't worth the value you may gain. You may "park" features which didn't pass testing. You may have dedicated subcolumn where you put such features so everyone knows that they require bug-fixing. Additionally you may decide whether these features count to your limits or not. I wrote more on such approach here. You may just visualize status of testing, e.g. testing started, testing passed, testing failed, with additional visual signal and keep the index cards in QA column. You get the same information you'd get with moving cards back but it doesn't introduce chaos to the board. I mentioned and described such approach here. You may deal with bugs using additional information radiator, usually not a full-blown Kanban board. Then, again, you keep the index cards in QA stage but you deal with bugs independently. Joakim Sunden shares a neat method to deal with such tasks. Either way my advice would be to start with a simplest possible method which seems to work. You probably neither want nor need a complex tool to cope with the problem, thus the first idea to just define the process in a way that makes the issue non-existent. By the way: QA comes from Quality Assurance which is way more than testing or QC (Quality Control) which is what you seem to do in your QA stage. Read more here. Third option is to mark the card blocked, and create a new card (maybe in a different colour) to track the impediment. or you can create a swimlane just for the impediments to flow, maybe with columns Not Started->In Progress->Done. If you create a separate swimlane, you can use that to track any impediment, not just defects. Which option you choose depends on your situation. 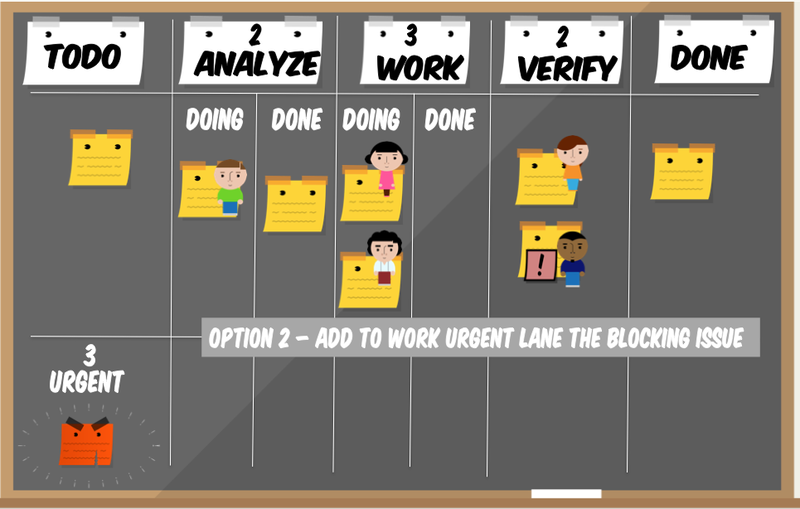 If you choose to block the card in the QA lane, then the card will be occupying one spot in your WIP limit. So while the block exists, you may have a tester free. If the team is cross-functional, that person could perhaps help out upstream in the system. If you prefer not to block up the WIP in QA (ie, have the testers continue testing other cards at full WIP), then Option 1 might be for you, as it frees up the QA lane. If you have a tight cross functional team, swarming might be the best option. The card gets blocked, tester & dev pair up, the defect is fixed, and it moves on. Shortest lead time. If you have handoffs, then Option 3 gives you more visibility. The important thing here is to implement one of the options and then keep taking steps to improve the system. Don't be content to just say, okay we can now handle defects on our kanban board, and leave it at that. For example, if you have handoffs and implement Option 3 to get visibility into the time taken to fix bugs, then look at that and ask: How can we shorten this feedback loop? Can we bring testing & development into closer collaboration? If you see a lot of defect cards generated at the QA lane, then ask: Why are we generating these defects, and how can we fix it? Should we implement acceptance tests up front? .. and so on. Pawel answer is great. I just published a simulation that visualizes how manage a mistake - check it on slideshare. We have similar situations in Sales and Marketing department in my company. When a salesperson was trying to sell our services. We dealed with it by dividing Done column into: Failed and Accomplished. This way we could get more information from analytics. We have also tried to archive tasks in the column when something with the sale didn't work out and to create another task/card with a special tag. Not the answer you're looking for? Browse other questions tagged kanban or ask your own question. 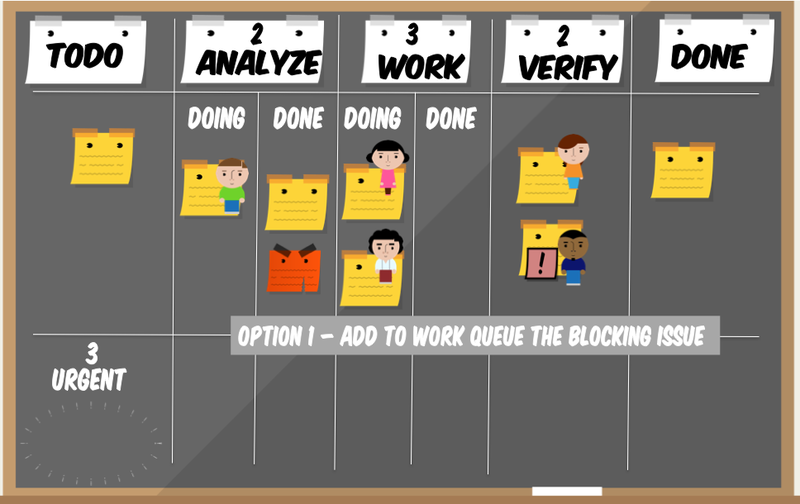 In a Kanban or Scrum workflow should tasks/stories move back? How are items with dependencies to other items handled in Kanban?